K1. Research and discuss underpinning theories of ethical philosophy and apply these in to a range of scenarios in an IT workplace environment. S2. Utilise professional presentation and communication approaches in a range of IT workplace settings. A1. Construct written and verbal arguments in a variety of formats on the evolving nature of ethical norms relating to new technologies. V3. Value ethical decision making approaches when working as an IT professional. Wayne Davidson is a software engineer in the aerospace division of Occidental Engineering, a large engineering firm. For the past two years he has been working as a test engineer for Operation Safe Skies, a project to build a prototype of the next generation air traffic control system, under contract with the U.S. Federal Aviation Agency. The company had bid very aggressively for the original contract. In fact they had bid less than it would take to do the work properly. They felt that was the only way they could beat their competitors, who were just as hungry for the work. Because of their somewhat shaky financial position, the company was not willing to take a loss on the project, so the project has been underfunded and understaffed. Nevertheless those working on the project have made a heroic effort, working eighteen hour days seven days a week to meet the deadline, because they know how much it means to the company, not to mention their own jobs. A version of the prototype has been completed and turned over to Wayne for testing. He has run extensive simulations on it and found that it works as it should except for one little problem. When there are too many aircraft in the system, it will sometimes lose track of one or more of them. The "forgotten" aircraft will simply disappear from the screen, there will be no trace of it anywhere, and it will be ignored by all of the collision avoidance and other safety tests. The software designers are confident that they can fix the problem, but it will take a month or more to do the redesign, coding and testing. Wayne meets with his boss, Deborah Shepherd, the project manager, to discuss the implications. She tells him that extension of the project by a month is impossible. The contract requires that the company deliver a fully certified, working version of the software in three days for system integration and test. They consider whether they can do a quick patch to the software before turning it over, but Wayne adamantly refuses to release any code that has not been tested thoroughly. "Then we'll have to deliver the software as is," Deborah says. "I can't jeopardize this project or the jobs of my people by missing that deadline." "We can't do that!" exclaims Wayne. "That's like delivering a car with defective brakes." Who else suffers or is at risk of suffering as a result of this aggressive bid being accepted? What duties is the project manager aware of, 3 days before project delivery is due? What duties is the test engineer aware of, 3 days before project delivery is due?The ACS Code of Professional Conduct extends the meaning of the six ethical values with requirements that contribute to observing the values. Examine the code and identify requirements (using value numbers 1-6 and a requirement letter) that are relevant to this case study. Explain for each requirement identified how it should be applied in this case study. Deborah and Wayne are attempting to resolve the ethical dilemma that they have. Having completed your ethical analysis provide advice as to how they should proceed, summarizing your reasons. 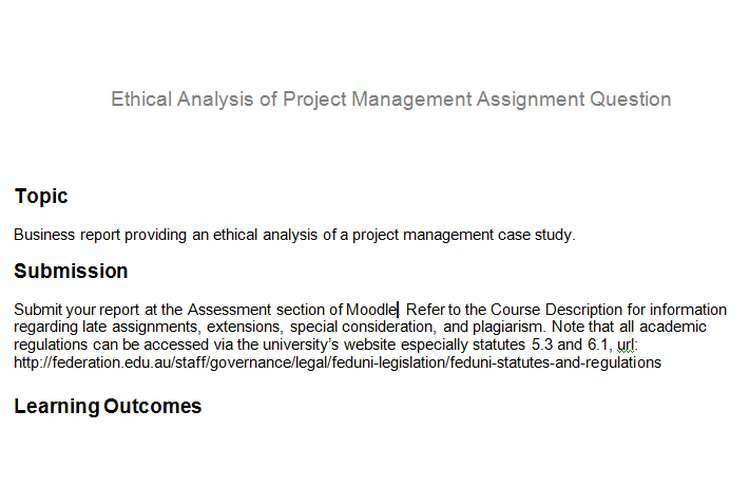 https://www.acs.org.au/ data/assets/pdf_file/0004/30964/ACS_Ethics_Case_Studies_v2.1.pdf At least three additional resources should be used in the preparation of your report. The introduction section should clearly indicate the issues being discussed and provides an overview of how it is intended to address these issues. The body section of the report should contain an evaluation of the ACS values against each of the philosophical theories in turn. The discussion should show an analysis of research undertaken that is synthesised with your own ideas.Writing should be validated with concepts from other people’s work. Gather these references from various sources such as the Internet, assigned text books and readings etc. The conclusion should be in your own words and should summarise your findings from the body. Adhere to academic writing standards such as correct grammar and spelling. Demonstrate signposting in your writing.